So I was supposed to be packing and shopping and generally getting ready for vacation today. Instead I made newspaper flowers. Why? Because newspaper flowers don’t make themselves, people. So I finally broke down and made some. For the big flowers, I grabbed a few random circular things from around the house and traced around them. Then I cut out the circles and cut slits into them, to make petals. I curled the edges of the petals by wrapping them around the end of a paint brush. Then I stacked the circles, from largest to smallest, gluing each layer down in the center as I went. To give the flowers some shape, I pressed down with the end of a paintbrush while gluing. I topped off each flower with an old earring. Then I fluffed and bent the petals to give the flowers more dimension and spattered some paint on them, just because. … and glued the circles together into five-petal flowers. Then I sewed a button on in the middle of each one. Probably not the best use of my time the week before I leave on vacation. But they make me happy. Meet my new state-of-the-heart bulletin board. This is what it looked like when I bought it (at a thrift store, of course). It had a nice beefy frame that was painted in a neutral cream color — and the paint was chipping in spots, so there was a little bit of mint green showing through here and there. I loved the chunky, chippy old frame. The orange cork, not so much. To de-orangify the cork, I broke out some leftover cream chalk paint (Americana Decor Chalky Finish/Lace). It took two coats to cover. I didn’t want my lovely new/old bulletin board to get overwhelmed with notes and photos and general clutter, so I decided I’d put a neat, orderly collage on the top half of it. To make the collage, I picked up three packages of different sized heart cutouts. The pink and red were not working for me, so I painted the hearts black. I found a map of Wisconsin online that I sized to fit the width of the bulletin board and printed out. I lined up the tiled pieces of the map, taped them together and then cut around the perimeter. Next I lightly traced all the way around the border with a pencil. Then I started filling inside the map with my hearts. I started at the bottom and worked from the outside in. I tried to keep the outside row of hearts as close to the border as I could. I also tried to keep the pattern random, alternating the sizes of the hearts and the direction they were facing as much as possible. When I had all the pieces roughly where I wanted them to go, I adhered them to the board. The formerly red glitter hearts I stuck down with rubber cement. The others were peel-and-stick. Here’s the bulletin board propped up on my desk. I can still tack notes and things to the bottom half of the board, but the top is all nice and neat. Valentine’s Day decorations are generally not my thing. Most of the mass-produced ones out there are way too saccharine sweet and frilly for me. 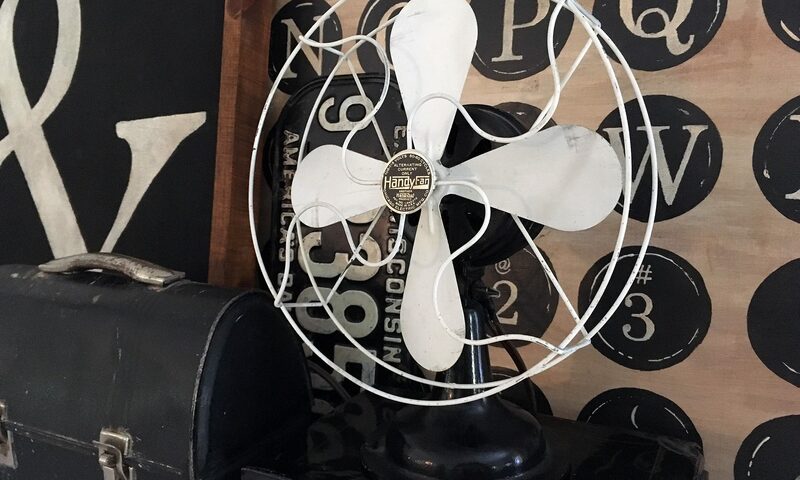 So this year, I decided I’d make my own Valentine’s Day decor: something with a vintage industrial vibe that I wouldn’t mind actually hanging in my house. I started with these little aluminum pans that I found at a thrift store. I wasn’t sure exactly what I was going to do with them when I bought them — but I knew it wasn’t going to involve baking. Pretty much every craft project I do lately begins with a coat of black chalk paint, so that’s where I started with this one, too. Then I cut a few hearts out of an old newspaper to layer over the black background. And, as luck would have it, I had the letters I needed to spell out the word “LOVE” in the stash of random letters and numbers that I have hoarded over the years. I wasn’t thrilled with the bright colors, so the letters got a coat of black chalk paint, too. Then I put some silver craft paint over top, slapdash style, letting the black peek through for a tarnished metal effect. … just big enough to pull a piece of twine through. … and I Mod Podged the newspaper onto the bottom on the pans. To tie the hearts all together, I threaded pieces of jute twine through the holes. The last step was to glue the letters on over the newspaper. Here’s the completed string o’ hearts. Love it. For reasons that aren’t entirely clear to me, my son decided he wanted a Wisconsin State University shirt for Christmas this year … which posed a bit of a problem because, as those of you who live in this neck of the Midwestern woods know, there is no such school as Wisconsin State. Apparently there is, or was at some time, a movement afoot to rename UW-Milwaukee Wisconsin State. I don’t think it’s gained much traction, but my son, a UW-Milwaukee student, is still holding out hope. Anyhoo, since I couldn’t go to the college bookstore and buy a Wisconsin State shirt, I had to make a stencil and create my own. I started by trimming a piece of freezer paper to 8 1/2 by 14 inches, then feeding it through my computer printer and printing the words “Wisconsin State” (in Rockingham Condensed) on the flat/non-shiny side. I weeded out all the letters with an Xacto knife. I saved the inside of the O and the A, but the rest of the letters were waste. Once I had the letters trimmed, I positioned the stencil. Then I ironed it onto the shirt. The shiny side of the freezer paper adhered to the fabric. I made my own fabric paint out of one part of textile medium and two parts of acrylic craft paint. Then I pounced the paint on with a stencil brush. I tried not to go too heavy with the paint because the thicker the paint, the more likely it is to crack. Once I had the letters all painted, I peeled up the stencil. Then I just had to flip the shirt inside out and iron it to heatset the paint. I’ve been a little obsessed with “turkey robots” lately. Some people call them “turkey assemblages.” Or “upcycled turkeys.” Or “steampunk turkeys.” Whatever you call them, they’re out there, and I love them. I’ve been storing images of some of my favorites on Pinterest and keeping my eye out for parts to make my own. A few weeks ago, I found an old vegetable steamer in a thrift store. I bought it, knowing that the flaps on the basket would make perfect turkey feathers. I also bought this thing. I’m not sure what it is. Maybe a tea strainer? But when I looked at it, I saw a turkey head. After I got my turkey parts home, I disassembled the steamer and soaked the pieces in vinegar for a few minutes to remove the lime scale. The bright, shiny aluminum wasn’t working for me, so I slapped a quick coat of brown acrylic craft paint on everything. When the Rub ‘n Buff dried, I buffed the pieces with a soft cloth and started assembling the turkey. They got a basecoat of brown acrylic craft paint, topped with Spanish copper Rub ‘n Buff, too. The beak was made from an old earring. I just snipped the end of it off. I found a couple of washers for the eyes. I put a bolt through the hole on the bottom of the turkey’s head and stacked six nuts on it to act as spacers. The head was screwed into a hole in the center of the body. Here’s what the head looks like from the front. After I had the head attached, I hung the feet off the rim of the turkey’s body. Then I glued on his facial features. Here he is all done. With Halloween closing in, I decided to get in the spirit and make a double-double-toil-and-trouble sign. Here’s what I started with: a thrift store frame I had bought a few years back, thinking it was the perfect size (11 1/2 inches by 36 inches) for a subway sign. I needed a sign blank, so I stole a piece of plywood from my husband’s stash and then sweet talked him into cutting it on his tablesaw for me. Once I had the plywood trimmed to fit, I painted it with some black chalk paint I had on hand. Then I drew up the sign in InDesign. The serif font is Copperplate, and the sans serif ones are all some version of Arial. The smiling skull and crossbones is a (really big) Wingding. I lined all the pages up, overlapping the words that spilled from one page onto the next. Then I trimmed off the bottom edge of each page and Scotch taped the pieces together. In order to transfer the design, I rubbed chalk over the back of the paper. Then I flipped the page back over, centered it over my sign blank and traced around the letters. When I had the letters all traced, I held my breath and started peeling the paper away to see if the design transferred. Except for a couple lines that I missed while tracing, the design transferred perfectly. Here’s the full sign blank (left) with the chalk outlines and the original printer version. Once I had my outlines, I just painted inside the lines with some white acrylic paint. I tried working from the outside in, so I wouldn’t smear the chalk lines while I was painting. To make the dots, I loaded paint onto the rounded end of a paintbush and pressed at somewhat regular intervals. After I had all the letters painted, I wiped off the remaining chalk with a damp rag and then put on a second coat of white paint. … a custom-made hand-painted Halloween sign. Here’s the sign mixed in with a bunch of other fall-ish things on my porch. When we visited Mackinac Island, bikes were everywhere — and I’m not just talking about on the streets (where no cars are allowed). A lot of the shops sell bicycle art and crafts and T-shirts. This old-timey penny farthing decoration was in the front window of Ryba’s Fudge Shop. All the bike art reminded me of a penny farthing wall hanging I bought at a garage sale a couple years ago when I was compiling stuff for a gallery wall. I had over-collected for the gallery wall, and the penny farthing didn’t make the cut. I hung onto it anyway, thinking I might use it somewhere else sometime. The mottled metal finish always seemed a little sad and tired to me, and the fun, bright-colored bikes and bike art on the island made me think my penny farthing needed an update. I started by basecoating the whole thing with black chalk paint. Then I pulled out the remains of some Annie Sloan chalk paint in Antibes Green that I had stored in my basement. I decided to paint the body of the bike in the green and leave the wheels black. It took a couple coats to cover. I liked the piece 1,000 percent better once it was green. I thought I might like it even better if I added an accent color. So I dug some Spanish Copper Rub ‘n’ Buff out of my craft supplies. The Rub ‘n’ Buff goes on flat. After it dries, you buff it with a soft cloth and it shines like metal. I loved the coppery color accents. They’re subtle, but they definitely add a little dimension. Here’s the whole penny farthing, all painted. Once I was done buffing and touching up the paint, I hung it up on my basement door. It didn’t come from Mackinac Island, but every time I walk past it, that’s what I think of. I love stenciling. It takes time and patience but absolutely no special skills. Anybody can do it. And you can make almost anything. Say, for instance, you wanted a dish towel with a retro black-and-white Santa image printed on it. You probably wouldn’t find one in a store, but you could stencil one. You’d just have to download an image you liked from The Graphics Fairy. And if you didn’t like that the finger on his left hand was pointing at nothing, you could redraw that hand to have a mitten on it. The hardest part of the whole project would be figuring out what to cut away from the image (the parts that you wanted to paint black) and what to keep (the parts that you wanted to remain white). You’d have to cut the silhouette out with a sharp craft knife. You’d want to mix a little textile medium in with some acrylic paint to prevent the paint from cracking after it dries. You’d want to pounce the paint onto your stencil. Then you’d get to the fun/nerve-racking part: peeling away the stencil to reveal the final image. If you did it right, you would end up with nice crisp lines of black paint on all the edges. And Santa would be smiling at you. Then you’d want to run a hot iron over the back of the towel to heat set the paint, and you’d be done. Here’s a Thanksgiving shadow box I (somewhat accidentally) put together the other day. It started with this plastic turkey-shaped cookie cutter that I found. It looked so sad and orange, I decided I’d give it a 10-minute makeover by wrapping jute twine around it. After 10 minutes of searching for — and not finding — my roll of twine, I moved on to plan B: wrapping it in string. Then after 10 minutes of attempting to wrap an orange cookie cutter in white string — and seeing lots of orange plastic peeking out in between the strands, I moved on to plan C: spray painting the cookie cutter white first. … at least not if your cookie cutter has lots of wonky indents and corners. If you use too much string on those spots, you get a weird bulge in the silhouette. If you don’t use enough string, there are obvious gaps in the coverage. And unfortunately, the more I handled the cutter, the more the white spray paint wore off. When I finally had the whole cutter wrapped in string, I touched up the orange spots that were peeking through with off-white craft paint. At this point, I decided I had invested so much time in the cookie cutter that I should showcase it in a shadow box. But my shadow box had been used many times before, and this is what the backer board of it looked like. All the pin holes and glue spots needed to be covered up. … and look what I found in the F’s. I rubber cemented the pages to the backer board and popped it into place. Here’s the full shadow box. It has a hinged cover, so it’s really easy to work with. I positioned my turkey so the picture of the turkey was inside him. But the shadow box looked a little empty. I knew I had some great fall filler inside an old battered, tattered mini suitcase. … and filled in the open space around the turkey with them. Then I put the cover on the shadow box and stood it upright. The nuts were packed around the cookie cutter tightly enough to hold it in place. My 10-minute craft ended up taking a little more than 10 minutes, but I’m happy with how it turned out. A couple years ago my son found himself in need of a purple suit. And not just any purple suit. He needed a purple suit with a long coat, in the style made famous by his favorite villain/Bruce Wayne’s arch nemesis. After searching high and low and finding no purple suits of any kind to be had, we put our heads together and decided if one couldn’t be bought, one would have to be made. I am not a good enough seamstress that I could sew a purple suit from scratch, but I told my son if he bought one standard-issue grey suit plus one standard-issue grey suit jacket from Goodwill, I would attempt to paint them purple and piece them together into Joker-appropriate style. The two suit jackets he bought (sorry, only one pictured here) were the same size and roughly the same color and style. The main difference was that one of the jackets had flaps on the front pockets. I bought two big bottles of purple craft paint (and used both) and one bottle of textile medium. I mixed the craft paint and textile medium in a 2-to-1 ratio. The textile medium prevents the paint from cracking after it dries. I had to really saturate the fabric in order to get the paint to cover the grey suit. To keep the paint from seeping through the fabric, I put a scrap piece of white foam board inside it. I did the same with the pants. The foam board was too wide to slide inside the pant legs, so I flattened an empty saltines box and used that to block the paint from bleeding through there. I painted one section at a time, sliding the foam core/saltines box along as I went. Once I had everything painted, I cut the jacket with the pocket flaps off above the armpits and threw out the top portion. The bottom portion I positioned along the bottom of the other jacket to fashion into a long coat. When I had the jackets lined up, I put a row of pins in to hold everything in place. For the vest, I started with another Goodwill find. I didn’t have the right shade of green on hand, so I mixed a little white paint in with the green I had to lighten it up, and then added the textile medium, just like I did with the purple. Again, I had to really saturate the fabric to get good paint coverage, so I put the white foam board in between the front and back of the vest to prevent seepage. I painted right over the buttons.